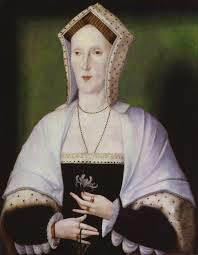 The life of Margaret Pole, Countess of Salisbury, was tragic from her cradle to her grave.l Nay, even before she was born, death in its most violent or dreaded forms had been long busy with her family—hastening to extinction a line that had swayed the destinies of England for nearly four centuries and a half. Her grandfather was that splendid Richard Neville, Earl of Warwick, the mighty King-maker, who as the "last of the Barons," so fittingly died on the stricken field of garnet, and whose soldier's passing gave to Shakespeare a theme worthy of some of his most affecting lines. Her father was the George, Duke of Clarence, brother of Edward IV, whose death in the Tower in January, 1478, has been attributed to so many causes. The murdered "Princes in the Tower," Edward V and his little brother, the Duke of York, were her first cousins, while her only brother, Edward, Earl of Warwick, was judicially murdered by Henry VII to ensure his own possession of the Crown. The list of tragedies in the family of the Blessed Margaret is still far from complete, but sufficient instances have been given to justify the description we have given of her whole career. Margaret, Countess of Salisbury, was born at Farley Castle, near Bath, on 14th August, in or about the year 1473. Her mother, Isabel, daughter of the above-mentioned "King-maker," died 22nd December, 1476, and her father in the Tower nearly two years later. During the reign of Edward IV, little Margaret and her brother were brought up at Sheen, with the children of her uncle, King Edward IV. At his death, Margaret and Edward, after a short stay at Warwick Castle—their ancestral home—resided for a short time at the Court of Richard III. When the crook-back King's son died, the youthful Earl of Warwick became de jure heir to the Crown, and Margaret, his sister, in the same way, Princess Royal. These short-lived honours, however, ended in 1485, when the victory of Bosworth gave the Throne to the Tudor Adventurer who, as Henry VII was to introduce a new dynasty and the oldest and most repulsive form of Oriental despotism into the realm! England, as the late Mr. J. M. Kerr shows in his well-known Elements of Public Law, was as practically free in 1485 as she was in the nineteenth century. By the time of the death of Harry Tudor's appalling son, the country had become as abject and prostrate as any of the dominions of contemporary Sultans or Rajahs! In 1491, when Margaret was about eighteen years of age, she was married by the King, Henry VII, to a distant relative and thorough-going supporter of his own, Sir Richard Pole. The Order of the Garter was conferred upon this gentleman, who hailed from Buckinghamshire, and in 1486, on the birth of Prince Arthur, the King's eldest son, he received the high position of Governor to the Prince of Wales. Lady Pole, as she was now, appears to have been happy in her union. Five children were born of the marriage, and both she and her husband stood high in the favour of the cold and calculating King. But one dark cloud hung ever over her. All this time her unhappy brother, the true heir to the Crown, lay in the Tower, his only "crime," of course, being that summed up in the phrase, "the right of the first-born is his!" Secluded from all society, and most shamefully neglected, the poor young Earl of Warwick grew up in almost total ignorance and simplicity, so as not to know, as men said, "a goose from a capon." Once, to expose the Lambert Simnel pretensions by the most convincing of all proofs, Henry caused the unhappy youth to be paraded through London, and this show duly over, the royal captive was again consigned to his lonely prison. Then in 1499, came his alleged attempt to escape, together with another claimant, the plebeian Perkin Warbeck, and the cruel and selfish despot had a plausible pretext for bringing the "last of the Plantagenets to the scaffold." This was one of the most brutal and callous State murders in the whole of English history, and the absence of any sort of protest either from the servile hierarchy or the upstart lords that bowed down before Henry's throne, shows how deeply the nation had already sunk in political and social slavery! The decapitated corpse of the young and perfectly innocent Earl, thus foully done to death, was interred at Bisham Priory, near Maidenhead, a place where his grief-stricken sister was to find a home nearer the end of her own sorrow-laden and tragic life. When the sickly Arthur married Catharine of Aragon, and went to keep his short-lived Court at Ludlow Castle, Lady Pole became one of the ladies of the Princess of Wales. The appointment must have carried with it poignant reflections on both sides. For Catharine herself believed—and was later bitterly to make her foreboding known—that no good could come of her union with the scion of the Tudor House, since that union had been brought about by the price of innocent blood! For the "most Catholic"—and most calculating—King Ferdinand VII, her father, had made it one of the conditions of his daughter's nuptials, that there should be no claimants to the English Crown. His royal brother of England had forthwith nobly obliged by presenting to the Monarch of Castile and Aragon, the head of the innocent Warwick on a charger—and "all went merry as a marriage-bell"—for a time! Catharine on her side, soon conceived a great affection for the sister of one so cruelly sacrificed to make smooth her own matrimonial path. She did all she could to forward the interests of the Pole family, notably after the death of Sir Richard in 1503. There can also be little doubt that when, in November, 1513, Parliament reversed the infamous Act of Attainder passed on her murdered brother and restored to Margaret's family the title and estates, forfeited on that iniquitous occasion, the excellent Queen Catharine again proved herself a friend at Court, and facilitated by her influence the partial undoing of this hideous murder by statute. When the Princess Mary, afterwards Queen, was baptized in the Church of the Franciscan Observants at Greenwich, the Countess of Salisbury—as Lady Margaret Pole had now become, owing to the reversal of her brother's attainder, and the restoration of the ancestral honours—held the child at the font. Nine years later, she was nominated Governess of the Princess, and appointed to preside over the Court of the little royal lady at Ludlow Castle, one of the official residences of the Princes and Princesses of Wales. Meanwhile the children of the Lady Salisbury were growing up, and the most interesting of them was undoubtedly Reginald, the future Cardinal and last Catholic Archbishop of Canterbury. Endowed by Providence with great personal beauty and rare mental gifts, he possessed what was greater than these, that sense of principle, and that elevated moral standard which were so conspicuously lacking to the ruling and upper classes throughout the Tudor period. A boy Bachelor of Oxford at the age of fifteen, he had afterwards studied the Canon Law at Padua. The world, indeed, was at the feet of this singularly gifted youth. Henry was to think of making him Archbishop of York after the death of Wolsey, and still later was even more intensely to think of having him assassinated! Meanwhile, as a most winsome and delectable youth, he was a decided "catch" from the matrimonial point of view, and good Queen Catharine, ever eager to serve a family that had suffered so much through her, but surely not by her, had ideas of marrying the Princess Mary to the brilliant son of her almost lifelong friend. The "future" of the much-discussed Reginald, however, was settled, and settled finally by the complications and menaces of the royal divorce question which became acute about 1527-8. A little later, the French Ambassador Castillon, horrified at the well-nigh weekly slaughter that had become almost a mere incident in the life of England at this period, exclaimed: "I think few Lords feel safe in this country!" Reginald Pole, to whom the King looked for learned and moral support at this crisis, was certainly one of the majority, so to save his head, he prudently withdrew to the Continent, under the pretext of pursuing his theological studies. The immediate effect of the King's divorce and subsequent marriage with Anne Boleyn, was to deprive the Countess of Salisbury of her post of Governess to the Princess Mary, and, indeed, to cause her forcible separation from her charge to whom she had become tenderly attached. Robbed thus of the friends of her youth—doomed to see many of them die in prison or on the scaffold—herself declared illegitimate and deprived of her just rights—is it any wonder that Mary learnt to loathe the very name of the "Reformation?" For from the first, its aiders and abetters ever showed themselves the thick and thin supporters of despotism—the despotism that plundered the church and the poor—cynically gave the "people" a Bible which most of them could neither read nor understand—and filled the whole country with nauseating phrases and catchwords redolent of cant and hypocrisy! All this has to be borne in mind in judging of the Queen of "bloody" memory. After the breaking up of the Princess Mary's household, Lady Salisbury went to live for a time at Bisham, close to her murdered brother's "last long home." The greater Abbeys, as is well-known, were not suppressed till 1539, but for many months before this, it was generally understood throughout England that the Religious Houses were doomed. Henry's prodigality was enormous, and his meretricious Court and the host of extravagances its pleasures—noble and ignoble—entailed, made him cast envious eyes on the age—long monastic Foundations and their material possessions. This was quite apart from their known dislike of his schismatical policy, and so the fate of Abbeys and Priories was soon sealed. The Priory of Canons Regular of St. Augustine at Bisham was dear to Lady Salisbury and her family, apart from its sacred character, and the fact that the remains of their murdered relative, the ill-fated Earl of Warwick, lay buried within its precincts. For it had been founded by William de Montacute, Earl of Salisbury, in the reign of Edward III, and so might almost be regarded as a quasi possession of the house. Lady Salisbury now advised the Prior not to resign the Priory unless the inevitable occurred, when, of course, all would be able to see that the dissolution had been made by force. The said Prior was ejected to make way for the notorious William Barlow, who shortly afterwards "surrendered" the House to the King. The year that saw the passing of Bisham and the rest of the abodes of "the Monks of Old," was the year of the appearance of Reginald Pole's treatise De Unitate Ecclesiastical The book gave the lie to almost every one of Henry's recent declarations on the subject of the Church, and in arraigning him at the bar of ecclesiastical history and Catholic doctrine, exposed him to the condemnation of Europe. The rage of the royal Nero, of course, knew no bounds. In vain did he command Pole to return to England without excuse or delay so as to lose his head! Equally in vain did he instruct Sir Thomas Wyatt and other of his agents abroad, to have his daring relative assassinated.1 Pole was now a Cardinal and busy pushing forward the initial negotiations and arrangements that were to prepare the way for the Council of Trent. His office as Legate to the Low Countries was all in the same direction—to make peace between the Emperor and France, and so facilitate the opening of the Council that was to do so much to heal the wounds of Holy Church. He was not, as Lingard shows (History, vol. v., chap. ii. ), engineering a crusade against the Tudor Monster, though, no doubt, the thought of such a movement was uppermost In many minds. Unable either to get the Cardinal in his toils or murdered out of hand, Henry struck at his kinsfolk and acquaintances. In November, 1538, Henry Lord Montague, Sir Geoffrey Pole, Sir Edmund Neville, the Marquis of Exeter, and Sir Nicholas Carew, were lodged in the Tower on the usual charge of "Treason." Historic accuracy compels us to admit that Cardinal Pole, like Lord Stafford in 1680, was not "a man beloved of his own relatives," at least in this crisis. His own mother had seen the danger likely to arise from his book and had even spoken of him as "a traitor." His brother, Lord Montague had likewise written letters of remonstrance to him. Needless to say all this was largely pro forma to divert Henry's fatal wrath, but whatever was the object all was in vain, and this crowd of noble personages, except Sir Geoffrey Pole, were done to death after the usual judicial mummery on Tower Hill, 3rd January, 1539.